Available in three colour schemes. 360 Degrees Safety has introduced a button down cuff option for a Micromesh shirt. The shirt has traditionally had a knitted cuff, which has a tendency to lose its shape. 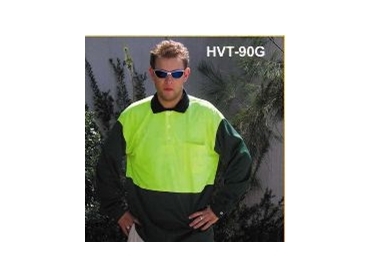 The shirts comply with Australian standards and are made from 140GSM Micromesh with a wicking treatment. They are available in three colours; fluorescent orange/navy, fluorescent yellow/navy and fluorescent yellow/bottle green. They come in sizes S-9XL. Short or three-quarter sleeve versions are also available, but with no buttons on the cuff. The company has also released the CS8 chemical-resistant suit, which exceeds EN standards. The suit is water resistant and has passed chemical spray tests with paints, motor oils, sodium hydroxide and hazardous particulate matter. It is suitable for use in general industry applications as well as in spray painting, motor mechanic, petro-chemical, medical and environmental cleanup applications.